One of my workmates lost all of her photos and contacts after upgrading her iPhone. According to an apple user said on Apple discussion, “After updating iPhone to iOS 8, I lost all of my contacts, text messages and imessages. Is there any way to get them back? !” If you are considering upgrading your idevice, you should newbielink:http://"
http://extract-data-from-itunes-backup.blogspot.com/2014/10/updating-ios-8-something-you-need-to.html" [nonactive]. More and more Apple users are encountering data loss due to the upgrade. Here I will list several methods to avoid data loss and recover iPhone data. How to avoid data loss before updating to iOS 8? 1.Clear you iPhone to make sure there is enough storage for iOS update. It has great possibility that the iPhone data lost if the storage space of iPhone is less than it is required. While updating to iOS 8, the storage is required at least 4.6GB. Some even required to have almost up to 6GB to do that update. It really depressed. Actually, to free up space for upgrading to iOS 8, you have to delete unused apps; Remove junk files from your iPhone; Delete text messages and iMessages; Backup photos and video to computer, and then remove them from iPhone. Permanently erase deleted files from your iPhone. 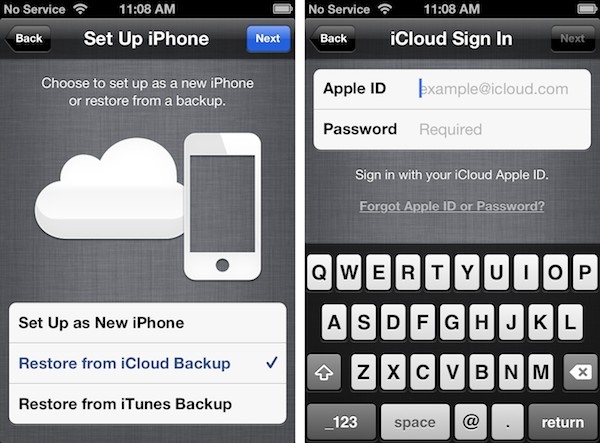 2.Make backups for your iPhone data. There are many convenient tools available for backing up iPhone, like iTunes and iCloud, and other backup apps, which is at your choice. You can make two backups in tow different ways to avoid any of messes. Make the most appropriate backup, it is a strategy. Here I want to recommend iTunes. As it is more storage saving. Using iTunes for updating is a simple and common way, which takes up only around 2GB rather than 4.6GB. After backing up your iPhone, you can extract data from iTunes backup and transfer the data to computer with the help of a free jihosoft iTunes backup extractor. 1.Connect your iPhone to PC with an compatible USB cable and run iTunes. Note: As you probably know, restoring from backup erases your current data and replaces it with whatever is in the backup. If you want to restore the contacts or text messages alone, and not everything else, you will need some other method. Restore iPhone Data from iCoud. Compared with iTunes, iCloud is much more convenient, all you need is Wi-Fi and a power source (no desktop computer). 3. Then turn on “contacts/text messages” and choose “Merge” on the pop-up window. 4. If it doesn’t work for you, try deleting your iCloud account, but KEEP ALL DATA! Then add your iCloud account again, and still choose “Merge” when prompted. If by any chance that your iPhone blocked and cannot be connected to computer. In this case, a simple as well as convenient way is getting help from free 3-rd party tool. Some iTunes Backup Extractor works well. As I know, It seems only Jihosoft iTunes Extractor is free. It can freely extract contacts without connecting iPhone to the computer. 1. Download the newbielink:http://"http://www.itunesextractor.com/" [nonactive]. Install and run it on your computer. 2. After installing and run iTunes backup extractor, it will automatically check all the iTunes backups on your computer. Select one you need to transfer and hit“Next”. 3.Specify file types you need to extract from iTunes backup. You can select all instead, but it takes a while for scanning if you have a large amount of files on your iTunes backup, you’d better choose what you want to save scanning time. 4. Preview and extract data from iTunes backup. In the scanning result, you may find all the data found. Simply click“Recover” to save and transfer to wherever on your computer. Of course there are many of iPhone users didn’t have backup available before they upgraded the iOS. Is there any possibilities to get lost data back in this case? Actually, the answer is YES. But, you should stop using you iPhone once the data lost, or even the powerful software cannot get your data back, as the storage space on your iPhone will probably overwritten by new content. I have tested many of data recovery tool, Here I recommended Jihosoft iPhone Recovery, which is specially designed to recover data from iPhone without backups. It can help to rescue more than 10 types of data from iPhone, including Camera Roll, Photo Stream, App photos & videos, Messages, Message Attachments, Contacts, Call History, Notes, WhatsApp, WhatsApp Attachments, and much more. 2.Connect your iPhone to computer and run the iPhone data recovery. If you are iPhone 6/6 Plus users and lost iPhone data by mistake and want to get it back, the quick way to do iPhone data recovery is using iPhone Data Recovery program freely.